Borussia Monchengladbach has permanently acquired the midfielder from Chelsea on a five-year deal. 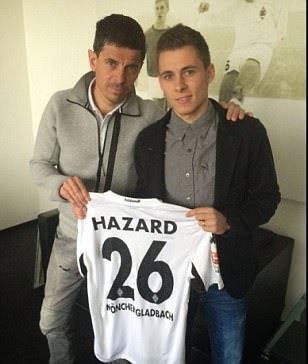 Thorgan Hazard has made his move from Chelsea to Borussia Monchengladbach permanent, with the Belgium international putting pen to paper on a five-year deal. The 21-year-old — brother of Chelsea star Eden — initially moved to Borussia Park on a season-long loan and has been a regular part of Monchengladbach side that sits third in the Bundesliga. The midfielder has four goals from 29 appearances in all competitions this season, including a late winner in the 1-0 derby victory over Cologne earlier this month. "Thorgan has indicated in the past few months what a great talent he is," sporting director Max Eberl said in a statement on Gladbach's official website. "We are delighted that we have managed to sign him and that he has decided to play for Borussia in the next few years." Chelsea has the right to exercise a future buy-back option on the player.